This is the official demo party results from the Atari Głuchołazy 2013. See also the Atari Głuchołazy 2013 homepage for more informations. 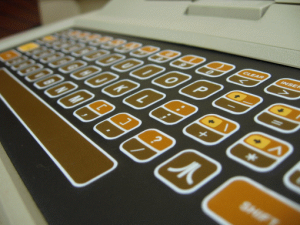 Added Atari 8-bit formats: IP2, IMN, ICN, DIN, IRG, IR2, VZI. Added “DEGAS Elite” icon (ICN). Fixed decoding of IPC. Thumbnail provider implemented for Windows 2000/XP. Fullscreen mode in HTML 5. 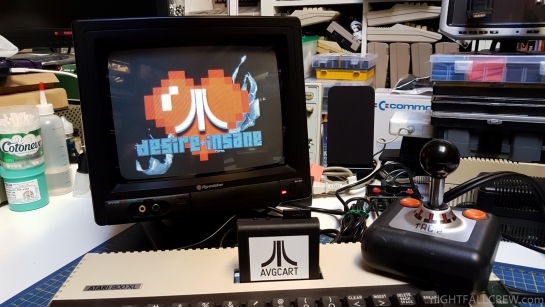 The aim of the A8CAS project is to create software to read, save and archive tapes for Atari 8-bit computers. Early Atari computers could store their programs on Compact Cassettes. Lots of commercial software was also sold on tapes. Some of the tapes employed different tricks to prevent creating illegal copies. 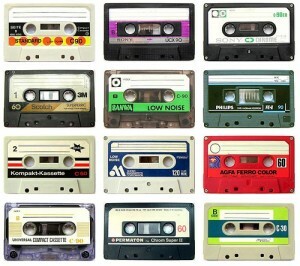 A8CAS aims to correctly read and write all such tapes. A8CAS is inspired by existing utilities, Ernest R. Schreurs’ WAV2CAS and CAS2WAV. Schreurs’ tools however did not support tapes with non-standard data (copy prevention mechanisms), and reading tapes from audio files was very unreliable. A8CAS addresses both of those issues. A8CAS now provides a superset of WAV2CAS’ features. A shared library, liba8cas, that contains all routines needed to read and write cassettes (support for CAS, HEX, FSK and sound files WAV, OGG, FLAC etc. is implemented). The library can be used in emulators and drivers for SIO interfaces such as SIO2PC; a set of command-line tools, a8cas-tools, that contains a8cas-convert, a utility similar to WAV2CAS/CAS2WAV. 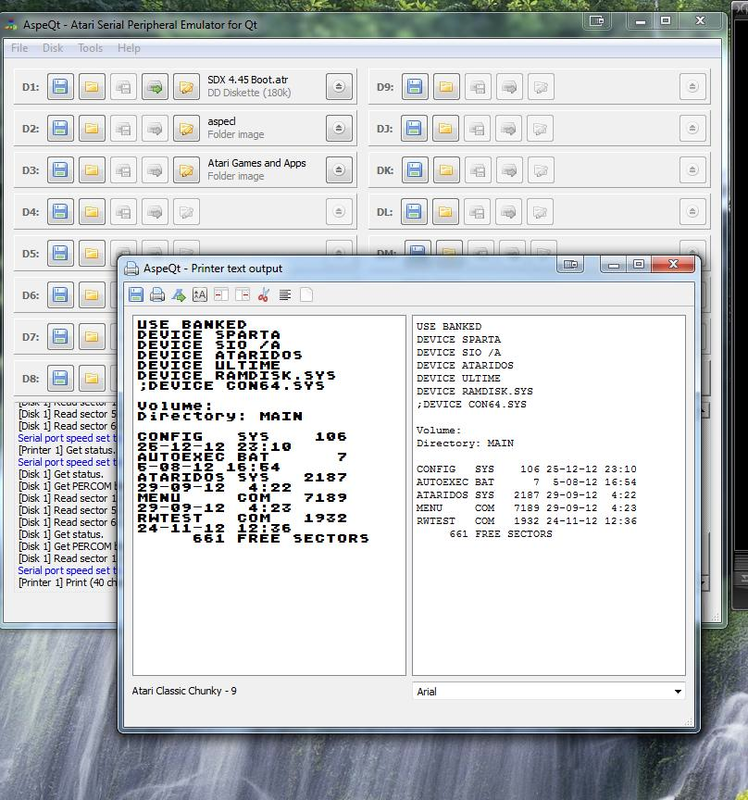 The tools use the A8CAS library; a patch for the Atari800 emulator, that allows to load and save tape files (CAS, HEX, WAV, OGG, …) using liba8cas. Added the A8CAS_flush() function to API, which ends any chunk being written and writes data from buffers to disk. Fixed the inability to adjust stop bit length tolerance during recognition of data blocks. It was hardcoded at 0.25, now it uses the value of the A8CAS_PARAM_BLOCK_HEADER_DEVIATION parameter. Fixed crashes when setting A8CAS_PARAM_BLOCK_HEADER_LENGTH lower than 20. Up to 15 disk drive emulation. Support for ATR, XFD, PRO and ATX (preliminary) disk images. Mount folders as emulated disks. 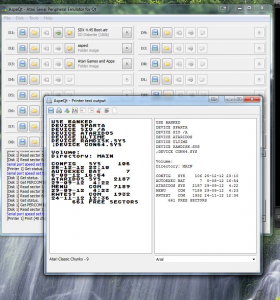 Text only printer emulation with PC print, save, and ATASCII font support. AspeQt client module (AspeCl) for Atari, communicates with the server and performs a variety of remote operations. Added Folder Image boot support for MyDos, MyPicoDos and SpartaDos. AspeQt now offers an option to switch between those 4 different DOSes automatically. The user no longer needs to supply the required DOS files or the file containing the boot sectors ($boot.bin) as AspeQt includes them and switches from one DOS to another through the UI. The context menu (right clicking on a mounted folder image on D1:) will present a window with DOS selections. 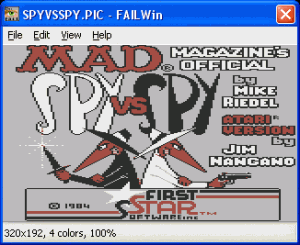 By choosing a DOS and clicking Apply on that window will switch DOSes and the next reboot of the Atari will boot selected DOS from the Folder Image. For details of the switching mechanism, the limitations of, and more, please see AspeQt documentation. Changed the color and boldness of the Folder Image names to visually differentiate them from other file images. Updated the English language manual. Minor re-grouping of drive slot buttons. The emulator is auto-configurable and will compile on a variety of systems (Linux, Solaris, Irix). This is a calendar in PDF format made by Marcin Dworaczek (a.k.a. mOOnie / MSB) for the new, 2013 year. All the graphics were presented on the latest SV2k12 edition, and come from the following authors: Piesiu, Ripek, Rocky, Ooz, Ukko, Templeton, Odyn1ec and Bracket. 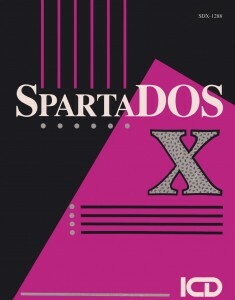 SpartaDOS X (or SpartaDOS 4.0) is a disk operating system for the Atari 8-bit family of computers, that closely resembles MS-DOS. It was developed and sold by ICD, Inc. in 1987-93. Set of SDX command descriptions for MAN utility (excerpts from the User’s Manual). Customized SDX images with SIDE driver are available at Jonathan Halliday’s website. 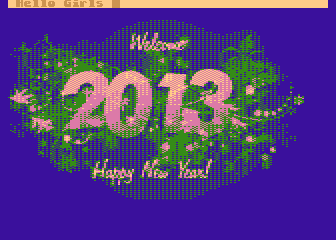 This is the 7th edition of the New Years Disc for Atari. In this issue you can find a lots of interesting things to begin a new year with our beloved Atari. Chicks on Chips by JAC! A bootable disc with a DOS. When it’s ready loaded type in: N* and press RETURN. A nice animation from miker. You’ll need at least 320k on your machine! After booting you’ll get into a viewer, where you can load ipc pictures. More about the whole thing can be read in the designated readme file. Synthpopalooza did a great job here. Simply press D and you’ll see, what pictures are on this disc to load them. ASMA v3.6 contains 4630 tunes, 315 of which are new! Moreover, ASAP has been updated to the latest version and SAPMaker has been recompiled to run under the latest Windows. Up to 6x SIO speed. AspeQt client module (AspeCl) for Atari, downloads information from the host to the Atari. Time/Date is an example with more functionality to come in the future. MainWindow of AspeQt is now fixed and can not be re-sized manually. Minimum screen resolution required is 800×600 for a proper fit on the display. Use of 1024×768 is recommended. Tooltips are added to display extended mounted image information. Added option to display/suppress message log window, setting is saved in registry/session file. Increased the supported drive numbers from 8 to 15 for SDX compatibility. Added option to display/suppress additional drives, setting is saved in registry/session file. Fixed SDX incompatibility of Folder Images. Added browsing capability for Folder Images. This release only allows read-only support with drag and drop file copying from the Folder Image. Multiple Folder Images can be mounted. 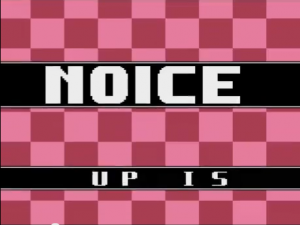 Liquid Candy is a new cool demo for Atari VCS/2600 by Noice released at the Silly Venture 2012. Run the .bin file in your VCS-emulator of choice (for example Stella), or use a Harmony or other cart to run it on the real thing!